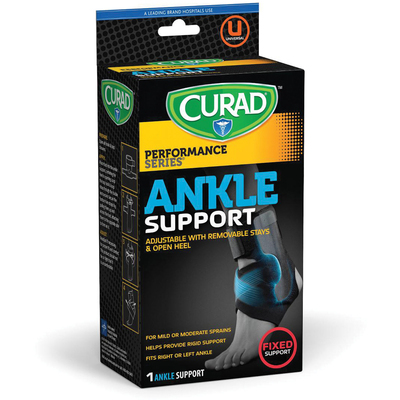 Ankle Support Provides Preventative, Rigid Support That'S Strong Enough For Athletes. Ankle Support Is Perfect For Use With Mild And Moderate Sprains. Designed To Fit Both Your Right And Left Ankle, This Support Fits Easily In Most Shoes. Removable Plastic Stays Provide Stability For Both Sides Of Ankle. Adjustable Straps Allow Customized Support. Open Heel Design Provides Added Comfort..
Ankle Support Provides Preventative, Rigid Support That'S Strong Enough For Athletes. Ankle Support Is Perfect For Use With Mild And Moderate Sprains. Designed To Fit Both Your Right And Left Ankle, This Support Fits Easily In Most Shoes. Removable Plastic Stays Provide Stability For Both Sides Of Ankle. Adjustable Straps Allow Customized Support. Open Heel Design Provides Added Comfort.